Your best opportunity to create your own social network??. Start your own social network today with SocialiseApp as it gives you the power to create a unique and distinctive social network package to take its place at the heart of the social network community.?? SocialiseApp meets the need for real time data access. This application enables sharing, browsing and socializing while on the move. ?? This app has a pleasing and friendly interface that is user-based, interactive and community-driven. The app strikes a perfect balance between content and design. Buy the app and give wings to your ideas, hopes and dreams of having a dynamic presence on the social network.?? If you need re-skin, custom work or AppStore/GooglePlay submission we will do all work for you, so you can just relax! Online Documentation and Support Forum? Monetize the app with ads from over a million Google advertisers worldwide. Get access to programmatic demand and best-in-class mediation tools to effortlessly maximize revenues. 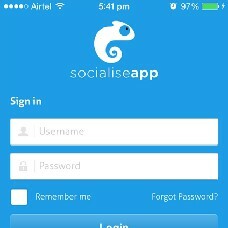 SocialiseApp allows you to create a social network app like Facebook or Twitter. End users can join using e-mail or by connecting with Facebook, Twitter or Google+. Once a new account is created, users can start to share photos and videos with other users, and create pages, customize profile, write private message, comments on posts shared by other users such as like, share and more. SocialiseApp has two different modes: only friends community or global community. Only friends community means that you can only see the posts of your friends, otherwise you can see all the posts, shared by anyone. In both modes, the app allows users to setup the privacy for each shared post. There are 4 different privacy levels: Public (all world), Community (only members), Only Friends and Only Me. Users can sign in using their account, or create a new one using Facebook, Google, Twitter or with e-mail. Users can share instant status, browse photos, videos, pages and friends while on the move. Users can catch up with the latest news feed activities in their community. Users can speedily and swiftly send and receive messages over their own social network. Each user has his or her own profile, with cover and pic, with activities that he/she can share in the community, basic info, tab for photos and videos. Users can create pages or groups and others can join. You can use groups also as multi-profile, pets, pages for vip, cars, etc. Each group have own profile with wall, video and photo section. Users can share videos from youtube or upload videos, and share photos. Users can receive push notifications on device for new message, friend request and other site notifications. Monetize your app immediately with Google AdMob. Users can comment on shared content like posts, photos and videos. Users can like content shared by others. Users can easily share on twitter, facebook, google or via e-mail content posted by others. Users can invite friends from device contacts. There are 3 ready to use languages (English, Italian and German), and you can add your own. Automatic detection of language used by user device. Easily change colour of app, there are 3 ready to use, in different colours (green, blue and gray). You can easy add a new theme by editing well organised PSD files. The app covers both Android and iPhone device. Receive support via forum or via email. A dedicated team can help you customise the app adding new features or extend existing. ?If Social login is available then provide the details for? ? Google - client Id and Client secret? ?Twitter - consumer Key and Consumer secret? ?Facebook - app id and app Secret?? ?Knowledgment in Photoshop if you want to customise a new UI color scheme? GooglePlay account which costs a one time fee of 25$? ?A licence for module tjatse.pullrefresh (purchase link) ?? Available documentation which guide you to setup a new app. If you have any questions about the requirements and technologies used, you can ask us before purchase via the comment area. You can easy re-skin the app alone if you know the technologies used, check the documentation where you can find more info on how to build a new app. However if you need reskin, custom work or App Store submission we do all work for you, so you can just relax!